I read a bit of Goodman Game’s The Dungeon Crawl Classics RPG Beta Test Version last night and really like what I have read so far; I hope I get to play this game. People are blogging about it all over the place; I figure I better get my comments in. Almost everyone raves about the art, which is gratifying since I did some of it. And, for a free ‘Beta’ set of rules, the production values are very nice (although there are a few bits of art that look somewhat ‘shoehorned in;’ I suspect this will be improved in the next version). As one of the artists working on the project, I can say that there is more art on the way (I just got another art request from Goodman), so if you like the art, there is more to come. The ‘Beta’ rules are simplified and the introduction admits that they are incomplete and there may be a few references to information that does not appear in the book; the Beta book allows players to play from levels 1 to 5… the full rules (coming in November) will bring this up to level 10 with a lot more content and options (and presumed improvements since players will offer input after test driving the rules). The introduction makes clear that Goodman took the ‘suggested reading’ from Appendix N in the AD&D Dungeon Master’s Guide (Howard, Leiber, Poul Anderson, etc.,) and tried to use that as the source material — the game intends to encourage a ‘sword & sorcery’ rather than a ‘high fantasy’ style of play. A lot of people are comparing it to Hackmaster (in spirit); a comparison I think is apt after reading the humorous ‘oath’ that players are expected to swear on page 4. The game mechanics are loosely based on the d20 mechanics from Wizards of the Coast… with rolling a d20 to hit a ‘target number’ and similar stuff. I haven’t delved too deeply into that yet, though. DCC also uses unusual dice from Zocchi/Gamescience like the d3, the d5, d16, etc. I guess I’ll have to buy a set of those. Some people seem to be really unhappy about the funky dice, but when I first saw them the d20, d12, d8, etc., all seemed pretty strange to me, so that does not bother me. One of the ways in which DCC differes from most (if not all) of the current crop of offerings in Fantasy RPGs is that everyone starts as a level 0 nonentity — cobbler, blacksmith apprentice, beggar, etc. The book suggests that each player roll up 3 initial 0 level characters (completely at random — no ‘custom build the guy you want’ here) who will be armed with randomly determined improvised weapons like garden tools or clubs and then the first adventure will ‘thin the ranks.’ Characters that survive long enough to get 100 XP get to be level 1 and can choose a profession like ‘fighter’ or ‘magic user’ or ‘cleric’ or ‘thief.’ Thus 5 players will start with 15 level 0 characters who will have improvised weapons and no armor… and then these guys will get fed into the meat grinder and the 1/3rd that survive will become level 1. There have been some complaints about this approach, but I actually find it refreshing. One of the trends that became evident in d20 3e era D&D is that character generation became the most important part of the game — the rules were so geared to offering players choices and options and rules for tricking out your PC that I think the most interesting part of the game (to me, anyway), i.e. : as a player interacting with the environment and each other, took second fiddle. Too many players had their eye on ‘what skill points should I take next in order to qualify for prestige class X, Y or Z in 3 levels’ to concentrate on the here and now. Since player characters were so time consuming to make, the ‘deadliness’ of d20 games seems to have been dialed back. The DCC RPG is based on the assumption that player characters will become more interesting to the players if they survive… and from what I have read so far, survival is not guaranteed. 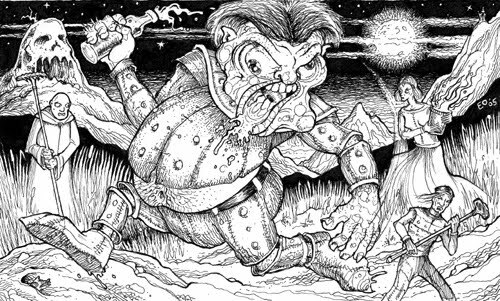 DCC RPG also brings back ‘race as class,’ i.e. : instead of being a dwarf fighter or an elf cleric, your class is ‘dwarf’ or ‘elf.’ Some people don’t like this. That’s the D&D that I started with, though, and I like it. I noticed that you can actually choose any class as a demihuman, but the demihuman classes are only limited to 0 level demihumans. As written, race and class seems separate. I'll try to research this elsewhere, but are the new dice types integrated in such a way that you could adapt those tables to the existing types? I'd imagine those might be the first sorts of user mods to hit the web, but I'm curious how integral they really are. a d3 is half a d6. a d5 is half a d10, A d7 is a d8 ignoring the 8 (or making an 8 a 4). A d16 is a d8 and any other die to determine if one adds 8 or not to the d8 on and odd roll. A d24 is a d12 and any other die to determine if one adds 12 or not to the d12. d30..roll a d30(I have one) or a d20 and a d6. on a 5 or 6 on the d6 squish the d20 roll to fit 21-30 optionally roll a d10 and a d3. The only one that looks really annoying is the d14 and that is still a d7 with any other die rolled to add 7 on an odd roll. I think I'd be more inclined to just pencil in different number ranges for tables relying on those dice. I don't need even more dice to sort through at the table. I agree with your criticism of 3e D&D, but doubt that DCC's 0-level approach is the best solution. I look forward to trying the 0-level “funnel” approach. I'm not certain it would be fun to start every game that way, but want to try it at least once. I've always wanted to start a game of D&D like the movie, “Night of the Living Dead.” The starting PCs meet when they all take refuse in a remote house that is being assaulted by undead. Each player character might have a weapon and the clothes on their back plus whatever they can scrounge from the farm house to defend themselves(perhaps lamp oil for molotov cocktails, breaking up the furniture to barricade the windows and doors, etc., just like the movie but medieval). This could be a fun game start for the DCC RPG I think — 12-15 0 levels go in, 4-5 1st levels come out.